I had the most phenomenal time in San Diego this past week! After leaving Minneapolis mid morning on Tuesday, I touched down in San Diego at about 2 PM. Grabbed a cab to Chula Vista and soon I was at my motel room with Dennis, Chris and Bo. That afternoon & evening we laid pretty low, but went to the Holiday Inn on the Bay and met FunkoFanJim for a drink and some FunKodes. It was a great way to start my week off! We met at the San Diego Convention Center at 7:30AM on Wednesday morning to stock the Funko booth for Preview Night. There were 11 of us that morning who worked very hard to get the ready for the crowds as we oohed and aahed over the items we stocked on the shelves, tore up boxes, unloaded palettes and inventoried the merchandise for the next 3 days of Comic-Con. I cannot tell you how very cool it is to pull Funko items out of a box and stock shelves with them. You get to see the incredible Funko Comic-Con items before anyone else does! It is like Christmas morning and you get to open all the presents! We all worked very hard and fast that morning in a Convention Center that did not have any air-conditioning on. To say it was a little warm would be an understatement. Soon it was 6:00 PM and preview night had started! There were suddenly people everywhere and I started seeing many of my Funatic Family members around the booth. The Funko merchandise was flying off the shelves and I found a place to stand near the side and tear down empty boxes to keep the booth clear of garbage so people could come through and buy up all the fantastic Funko merchandise. Then as quickly as it started, it was over and we headed back to Chula Vista to have dinner at Denny’s and get to bed so that we could get up and start the next busy day at the booth! Thursday morning I arrived at the booth and was show the ropes for ringing up customers. So there I was sitting on a stool behind the Funko counter, ringing up people purchases, answering Funko questions, steering people to different vendor’s websites for items that were not Comic-Con exclusives and people-watching. Can I say how much fun it is people-watching at eth Comic-Con??? I enjoyed every moment I spent at that booth watching people and hanging out with my fellow Funatics. I would like to send out a special shout to my fellow “booth workers”. Davezilla, Kimzilla, RFDennis, Bo, Grego, Ron, Ivanna, Richie, Kyle and our leader Brian! I truly enjoyed every moment I spent with you! This was one of my best Comic-Con experiences EVER! After another full day at the booth, we headed to “Funko Fun Day 7” at the Holiday Inn on the Bay! What a wonderful stupendous incredible phenomenal event it is! Every year Brian says he is going to top last year’s event and I think to myself how can he possibly do that…………..and then it happens!! After a eating a great spread of food and having a complimentary drink the festivities begin with Brian’s (what I like to call) “The State of Funko Address”! He then talks about the upcoming new licenses and the vision of Funko’s future! 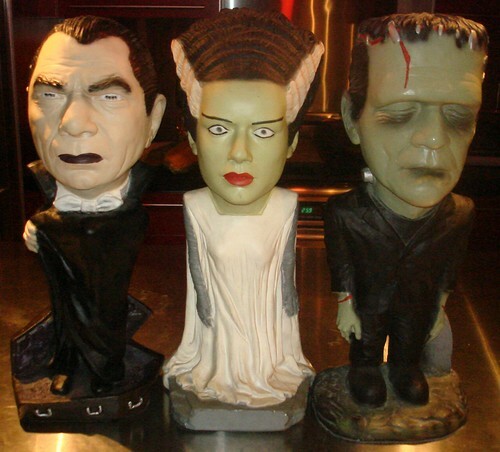 Like the Universal Monster wobblers coming (Dracula, Wolfman, The Mummy, The Creature from the Black Lagoon). The talking Seinfeld wobblers will now be a reality. The Rat Fink monsters will also be developed into wobblers by Funko. The Rolling Stone licensing agreement in which anyone (musician, actor, etc) that has graced the cover of the magazine can be developed and any of the photographs that were taken by the magazine during the shoot can be used to create a wobbler. This really opens the field on people who can become Wacky Wobblers by Funko! The Star Wars license has some great stuff coming too! The Hanna-Barbera license still has some great stuff coming too! All said, we have some great stuff coming from Funko and I personally cannot wait to see it all! Brian listens to what his serious collectors ask for and with the upcoming stuff in the works...well need I say more! Brian, we love you man! Then Funko inducted 5 new Hall of Fame members to the group. Cardgame2-Cathy Umberto, Jennifer-Jen Vannatta, RDK-Ray Kolassa, xHemlockx-Bo Wolfe and Chester-Paul Collis! All of them excellent choices and very well deserved honors! Being a member myself I am very, very happy to welcome all of you to the “Hall”! There were also several other awards given away; Collector of the Year—ShoMeNodder (Carol Lamb), Rookie of the Year—Cigargent (Keith), Newcomer of the Year—Steve the Tiger, Funko Spirit award—Yoohooal, Proto “Ho” Award—Alleycat (Craig Forstater). There were other awards given, but I do not remember them all. All I do remember is that all were well deserved and all the recipients were given wonderful Funko awards that would make any collector ecstatic! The BOF’s were out-of-this-world Freddy Funko goodness!! There were a few different variations of an Iron Man Freddy Funko, Storm Trooper Freddy Funko and Star Trek Freddy Funko. Some have chrome bases, some were 48’s, some were 144’s, but all of them were Brian’s hard work in getting Lucasfilms, Universal and Marvel to allow a toy company to put the head of their mascot on one of their very famous characters. That alone is proof right there how much Brian appreciates us Funatics! The fact that he would got to all that trouble to make us happy says a lot about Brian and how much Funko loves it collectors. I do not believe that any other toy company would go to that much trouble to thank its collectors. I will say it again Brian, we love you! The amount and quality of the protos that were handed out were mind-blowing! I am sure Craig (or “proto-ho” as Brian called him) was moist over the amount of protos that were on that table. There were very few white protos on that table, 99.9% of them had color and I mean BRIGHT colors on them. It was surely a thing of beauty and a sight to behold! I am sure that all the recipients were very happy to receive them! I know I was happy for the two protos that I received that night! 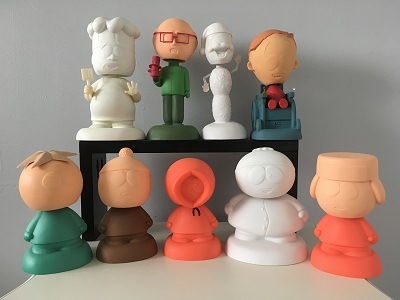 The customs that were presented to Funko by its collectors were incredibly unique! There was something for everyone’s taste and you could not help but admire the time and effort that had been put into them. Bob (Funkolicious) won the Custom Contest with his Freddy Fink entry. If you have not seen the pictures of it yet……it is incredibly phenomenal and will take your breath away. How so much talent can reside in one person’s hands and mind is beyond me, but I am certainly glad to know Bob and have received some of his incredible handywork! Congrats Bob!! There were some other great Funko prizes on that table that had most of us Funatics drooling and wanting them. If you have not read about them here is an impromptu list; 40” Glow Freddy, 20” Super Freddy, 20” Metallic Blue Huckleberry Hound, 7” Metallic Blue Tuxedo Freddy, 7” Metallic Red Huckleberry Hound, Glow Johnny Fang and a Metallic Grape Ape Bank! All said it was a great Funko Fun Day! Again Brian, we love you! Saturday was a very bittersweet day because it was my last day at the CC and my last day to “work” with my buddies at the Funko booth. I enjoyed the hell out of myself and I miss everyone so much. The last 6 months have been HELL for me and this was one of the best weeks out of my life I have spent in a very long time. It was so nice to get away from my frigging life for a bit. Thanks go out to many people for making this last week such a great time! Thanks first and foremost to Brian for making all of this Funko Fun possible!! Thanks to my roomies Bo, Bob, Chris & Dennis for assisting my handicapped a** and making me feel like a “normal” person for the last week. You guys are the best! Thanks to my “co-workers at the booth Ron, Dennis, Bo, Grego, Dave, Kim, Ivanna & Richie for making me feel very useful and entertaining me! Thanks to all the new Funatics and “old-timers that I got to meet for the first time! Cathy (Cardgame) it was AWESOME to finally meet you after all these years! Big Mama you are a hoot and a welcome addition to our Funatic forum! It was great to finally meet you in person. Rustydog, you are one cool kid! George it was good to meet you too even though it was on my last day…better late than never eh? Kyle it was good to meet you too and see your skills in creating those Nodniks for Funko! It was also wonderful to meet Cliff’s Fiancée Julianna! I also got to meet John’s wife (videguy) Maggie! Always great to meet wonderful people! And finally it was phenomenal to see all my old Funatic Family members at our yearly gathering...........I just wish we could all get together more often! A big shout out to Dork, Cliff, Julianna, Yoohooal, Brad, Carol, Cathy, Craig, Jennifer, Stephanie, Wacky Kim, Swobobafett Jason, Chester, Videguy, Bobbleboy, Dustman you absolutely Rock Dude! Funkofan Jim & Brad, RDK, Love-the-angels and family, Charger14, wow if I forgot anyone my apologies! I can hardly wait till next year! Thanks everyone for making my vacation so special!! Re: What I did on my summer vacation! Dang...it would take me a full week to write all that. All I can say is, Kevin, you are one hell of a great guy and I was fortunate to have gotten to room with you and the other crazy guys. you got all that from people watching? amazing . Kevin it was a real treat meeting you, you are a sweet heart cant wait to do it all again next year. Great recap, Kevin. Always good to see you my friend! AS USUAL, KEVEN YOU ARE A GREAT FUNATIC.I JUST LOVE SPENDING TIME WITH YOU AND HANGING OUT.. I CAN WAIT UNTIL NEXT YEAR. I HOPE BOB WAS A GENTLEMEN. Kevin, they don't come any sweeter or cuter than you! I love getting to see you at fundays! That was beautifully written, thanks for taking the time! It was great getting to see you again Kevin! It certainly was a great week! Kevin your one of my favorite peeps. It's always good to see you. "Pixie & Dixie and Mr. Jinx, Please!" "Just a pillow of the community"
Great wrap-up Kevin! I sure wish I could've joined in some of the fun with you guys! NEXT YEAR- I PROMISE! It was good seeing you again too! I even caught a few smiles from you! Man, I sure wish I was there this year! Thanks for sharing your news, Kevin! "The Bone daddy had a rather el diablo-may-care attitude towards life, which impressed me at the time. Being that they were both made of Crystal the number of this post CALLS FOR A CONTEST!." Hi I am Mikey also known as Sheckster. Always a pleasure to get to hang out and talk with you buddy ..
Great seeing you smiling .. even grinning .. Thanks for hanging with me Ron! kevinbuddha wrote: I had the most phenomenal time in San Diego this past week! After leaving Minneapolis mid morning on Tuesday, I touched down in San Diego at about 2 PM. Grabbed a cab to Chula Vista and soon I was at my motel room with Dennis, Chris and Bo. That afternoon & evening we laid pretty low, but went to the Holiday Inn on the Bay and met FunkoFanJim for a drink and some FunKodes. It was a great way to start my week off! I stumbled upon this KevinBuddha thread from years gone by and as someone who got into the Funko game waaaaay late, I thoroughly enjoyed it! I thought others might be interested in this great read! Thanks for the necro bump that was a fun read! Kevin you are an awesome Funatic and hope to see you at Minneapolis FDO in 2020! looks like you were shipwrecked! Some very fond shared memories, Kevin. So happy to have been part of the gang. I miss most of you so very much. WOW! What a great writer I am huh? I still remember all the fun and the family there. Some of the best memories of the last 25 years of my life. I miss all those mentioned more than they can imagine. Here's to the 2009 Fundays and Comic-con memories! I desperately wish I could have been a part of the earlier days. What a fantastic tale. Thanks for sharing. 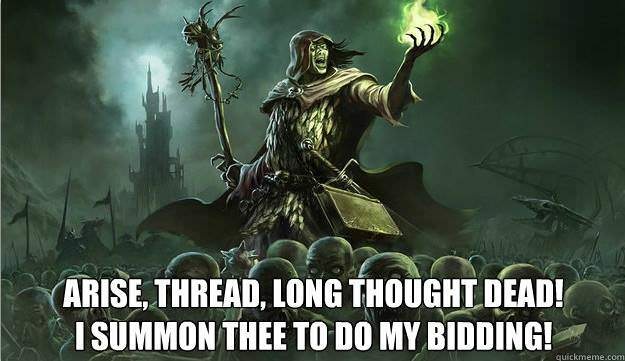 i get in trouble for necromancy all the time. xmaldigolax wrote: i get in trouble for necromancy all the time.